FAQ's, information and a couple of how-to's. 9-3ss/sc from 2003 to 2011. Firstly, park the car so you can get in and out of the passenger door. 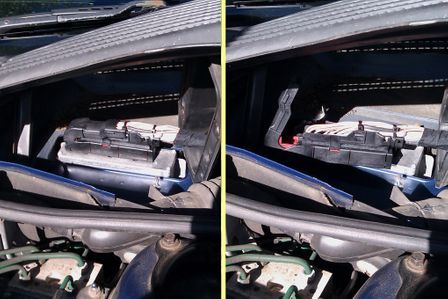 Undo the bonnet and disconnect the battery making sure you don't have your keys in or near the ignition when you do it. The ECU is held in with 4x 10mm bolts and two slide-lock connectors. Be very careful with the slide-locks and levers, they always stick but they can break if forced. On top of each connector there's a metal lever that operates the slide-lock and it's prevented from moving by a small ridged button in the middle of the top face of the connector. Press on that to allow the lever to pull up slightly, but 1-2mm only. DON'T try to pull the lever any further, it's only located on the connector by plastic rivets on each side and they break well before the slides come unstuck. On the bottom end of the connector you'll see the two sides of the slide-lock protruding out. Using a screwdriver or similar, push each side into the connector just enough to free it, same each side, but only about 1-2mm. The metal lever on top should then be able to take them the rest of the way. In many cases the slide-lock needs just a bit of extra manual assistance at the end of the lever's travel to allow the connector to come completely free. Once it's out you can close the bonnet and then get in the passenger side and push all the other door locks down by hand from the passenger side. Exit by the passenger door and lock that with the metal emergency key. 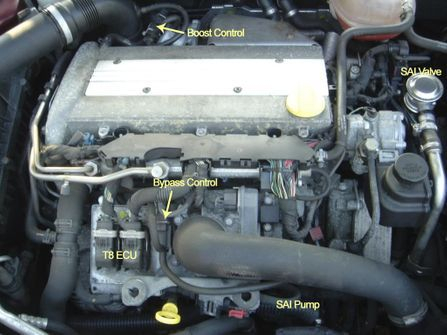 When you get the ECU back just do everything in reverse, reconnect the battery last and the car will never know anything has been touched. No error codes, nothing. The ECU is located on the passenger side under the plastic scuttle panel (below the windscreen). Step 1. Get a Saab 9-5. Step 3. Pull up the middle few inches of the rubber seal strip. Don't pull the end of the strip off (on the wing) as the plastic clips are a pig to get back in and they may break. Step 4. 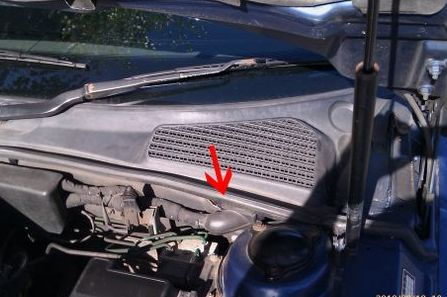 Undo the plastic screw next to the bonnet hinge and pull the retaining plug out of the hole. Step 6. 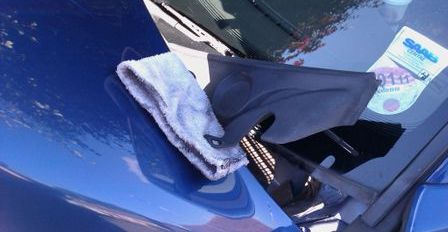 Using a cloth to protect the paintwork you can hang the scuttle panel out of your way on the edge of the bonnet. Step 7. You now have access to the ECU waterproofing boot. 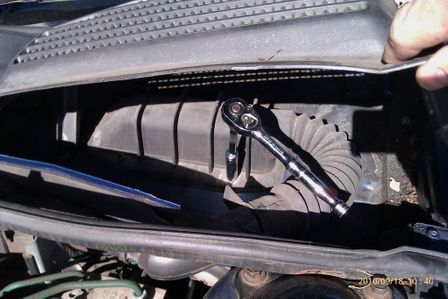 It's held down by four 10mm hex nuts. A squirt of penetrating oil may help free them if they're rusty. Step 8. 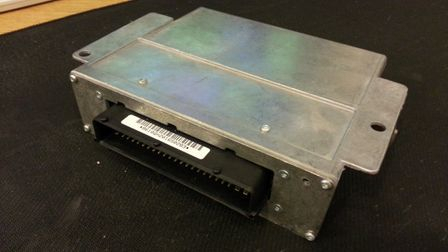 The boot will lift up to reveal the ECU itself. The large connector on top is removed by lifting the middle of the clip. Step 9. The tricky bit. The ECU itself is held in by two 10mm nuts, one on each side of the ECU about halfway down. You need a long socket or an extension to get at them. If you have the fingers of a concert pianist then you should be able to keep hold of them when they come off. 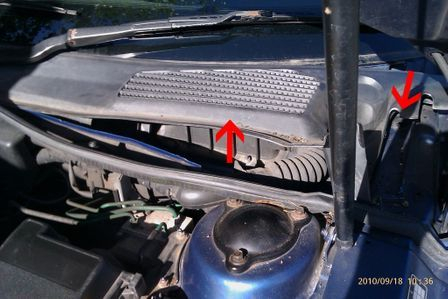 For the rest of us a blob of blue-tak or reversed sticky tape inside the socket ensures they don't drop down into the passenger footwell (if you're lucky) or on top of the glove box and wiring loom (if you're not). If you need the immobiliser code, it's on a long thin sticker on the back of the ECU connector, not on the big stickers on the front of the ECU (even though there is a code that looks like it). You may be able to take a picture of the code without removing it completely by using a camera phone on its own or with a mirror. Replacement is the reversal of removal.